A native of Scotland, after graduating from Edinburgh University with an MA in German, Kay McBurney spent much of the early eighties knocking about Germany and Austria, initially earning a crust as a teacher of English before taking up translation. 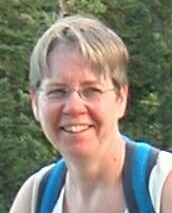 She now lives in Edinburgh, working as a freelance technical and business translator. In recent years she has increasingly turned her hand to the more creative end of the commercial market, but the Franconian/Scots poetry workshop was the first time she dipped her toe into more literary waters.